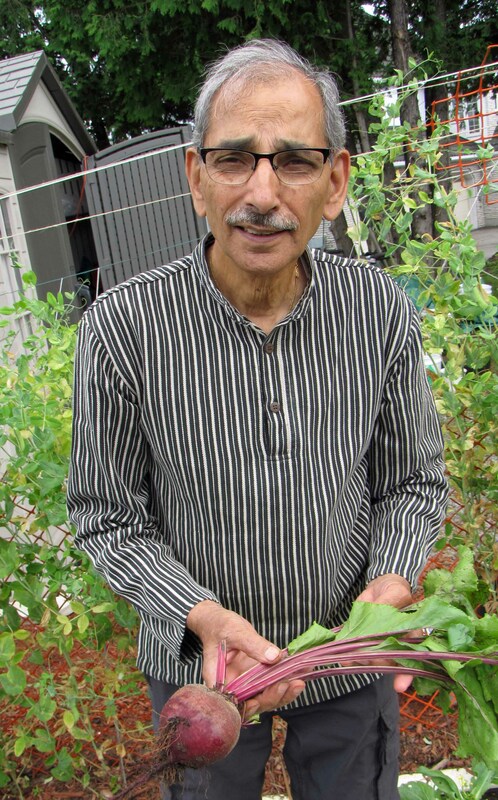 Dr. Shiv Chopra in his garden. 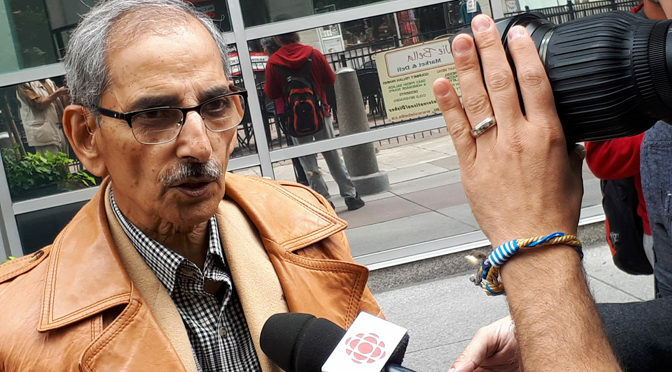 On January 7, 2018, Whistleblower Dr. Shiv Chopra died, just three months after a 13 year court battle with Health Canada. The Federal Court of Appeal ruled that Dr. Chopra was guilty of insubordination (Sept 6, 2017). He was fired in 2004 for blowing the whistle on Health Canada’s corrupt drug approval process. Working with Shiv over his last four years has been a privilege and an honour. To me personally, Shiv was like a multifaceted diamond. He was so many things to so many people. To his family he was the consummate caring husband, loving father and wise grandfather. To his colleagues and the public he was a veterinarian, a microbiologist, a scientist, a health regulator, a rights defender and a whistleblower. He was also a poet, a researcher, an author and his community knew him for his fervent leadership in field hockey. The place though, where he felt most rooted was in his organic garden and I think that is understandable because of his passion for safe and healthy food. In 1998-99, Dr. Shiv Chopra and two colleagues testified at the Senate Agriculture and Forestry Committee investigation that Health Canada managers had pressured them to release suspect veterinary drugs into the food chain without the evidence of safety required by the Food and Drugs Act. … a member of the Selection Board, Norman Stevenson, asked me as follows: “Suppose you are selected for this post, whom would you consider to be your client?” I replied: “The public, of course.” “No, it is the industry,” said Stevenson. I begged to disagree with him. “From whom do you draw your mandate?” asked Scott as a follow-up question. “From the Food and Drugs Act, passed by the Canadian Parliament on behalf of the public” I replied. I hate to think that the reason I failed to obtain this post was due to my answers before this Public Service Commission Selection Board. Forbidding scientists to speak to anyone about their work. By refusing to collude with what they saw as a breach of the Canada Food and Drugs Act by their own department, Chopra, Dr. Margaret Hayden and Dr. Gerard Lambert joined the ranks of courageous Canadians who have sought to protect the public interest by performing their duty as public servants, doing their jobs with integrity, even when doing so brought them into conflict with their bosses and risk of dismissal. The way the corporations, Canadian government, the justice system and media attacked and mistreated Dr. Chopra speaks volumes about the state of our government and world today. All Prime Ministers including Chretien, Martin, Harper and Trudeau have vilified Dr. Chopra by not protecting him when he spoke out about Health Canada disobeying the Food & Drugs Act. The Feds spent over $10 million dollars and 13 years to conclude that Dr. Chopra was insubordinate. Canadians should be ashamed, outraged and motivated to get this story told to get real whistleblower protection legislation into practice so that all citizens can experience genuine accountability and a healthy food system. NOTE: Dr. Chopra’s 2000 paper on Bayer’s Baytril antibiotic has been banned from public scrutiny since 2004. 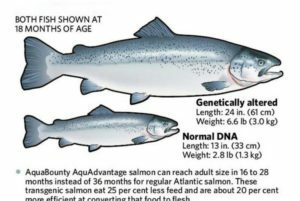 Actions to pressure Health Canada to obey Canada’s Food & Drugs Act and Regulations. Education – Use of organic, permaculture and greenhouse gardening as a practical teaching tool (K-12) for all subjects in the school curriculum. If you want to honour Shiv, use your voices and conversations to make Health Canada accountable and to ensure that future Canadians can enjoy a sovereign food system that is the healthiest in the world. Quote from: Jules C. Dervaes, Jr. (1947 – December 2016) an urban farmer and a proponent of the urban homesteading movement in California. “In our society, growing food yourself has become the most RADICAL of acts. It is truly the only effective PROTEST, one that can – and will – overturn the corporate powers that be. By the process of directly working in HARMONY WITH NATURE, we do one thing most essential to CHANGE THE WORLD – WE CHANGE OURSELVES. 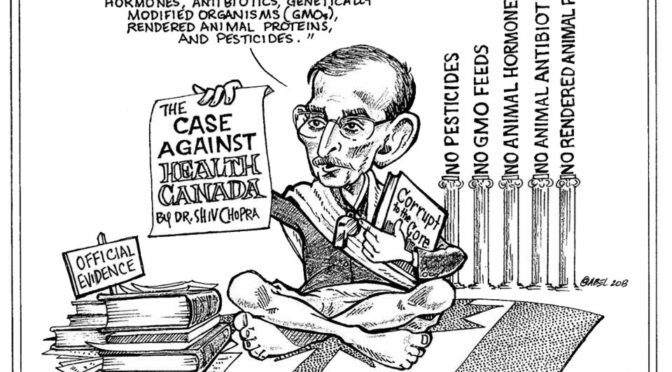 Many people called Dr. Chopra a whistleblower and hero but to Shiv, he was just doing his job, speaking truth to power and trying to provide Canadians the safest and healthiest food for all. Humble and fearless to the core. Bless you Shiv. The Supreme Court of Canada recently ruled that medical marijuana users have the right not to have to smoke their medicine. Bring on the pot-infused cookies, lozenges, oils and teas. 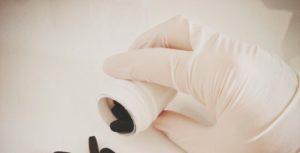 For some conditions alternative cannabis treatment is more effective and less risky than inhaling. Until the SCC ruling it was a criminal offence for medical users to ingest pot in any other form than dry leaf. Wellness custodian of the land, Health Minister Rona Ambrose was “outraged” by the ruling. For some, outrage would have been justified had the ruling favored the status quo whereby a mother of a seven-year-old would have to insist Johnny take his medicine by sparking up a joint to get his seizures under control. According to former Health Canada drug evaluator Shiv Chopra the real outrage is that “Health Canada is violating its own Food and Drugs Act by playing fast and loose with drug approvals, allowing drug manufacturers to regulate themselves,” and not insisting on ‘rigorous safety reviews’ as Ambrose claimed. For Chopra the outrage is that 15 years after he and two fellow scientists, Margaret Haydon and Gérard Lambert blew the whistle on their Health Canada bosses for licensing drugs of questionable safety, nothing has changed.